The best way to learn about current and upcoming activities hosted or recommended by One Island is to check out our newsletters. You can also subscribe to the newsletter. If you are curious about what we have been up to the past few years, check out the archive of events below as well. Santa Fe Indian School Contest Got Eggs? Where does Kona’s Water Come From ? The One Island Sustainable Living Center is hosting Sustainable Saturdays and invites all ages to come join in our fun learning and activity programs. For October our project focus is on Garden Restoration and our education presentation will be on Butterflies of Hawaii. Big Island’s FIRST West Coast Sustainable Energy Fair in conjunction with the American Solar Energy Society nationwide tours. Hosted by the West Hawaii Sustainable Energy Project. Stop by our displays at the SOUTH KONA GREEN MARKET 9am-1pm.Sign-ups for October and November WHSEP energy grant workshops welcomed at this event. Please plan to carpool to reduce our carbon footprint! October 10th One Island staff are attending The Eagle & The Condor training: Ancient indigenous prophecy of the eagle and the condor speaks about our time as one of great change and awakening, individually and globally-bringing forth the merging of heart & mind, science and religion, and a sense of deep interconnectedness. Adapted from the global symposium Awakening the Dreamer, Changing the Dream by the Pachamama Alliance, The Eagle & The Condor steps into a level of personal myth and indigenous wisdom from which actions in the world flow with organic grace. December 19-22 Hawaii Healing Garden Festival ~ come learn about our programs and good-for-the-earth / good-for-the-body workshops and services. 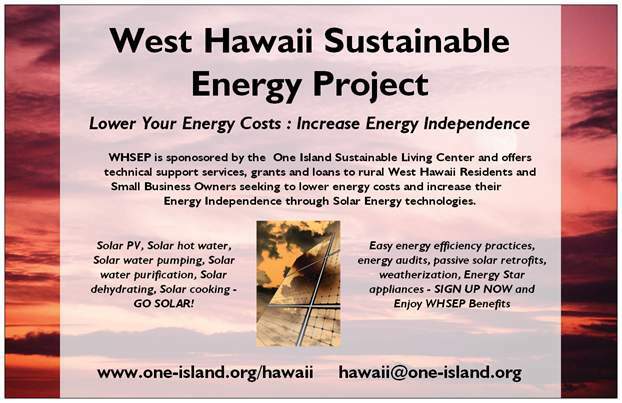 Sign-up for our 2010 West Hawaii Sustainable Energy Grant Assistance too! Date: Sunday, December 20, 2009 Time: 9:30 am – 4:30 pm Location: Amy Greenwell Garden December 31st GRANT DUE DATE Grant applications due for WHSEP pilot project. Grantees will be announced by January 30th and equipment vouchers distributed March 1st, 2010.